Capitalism makes us sick. It keeps us sick. It profits from us being sick. Health care in the United States, as in any capitalist system, is commodified. Every aspect of health care--sickness and health to medicines and doctor’s visits to insurance and research--is constructed around generating huge profits for a tiny group of bankers and CEO’s. Women’s bodies are controlled -- all people who identify as women, their bodies are restricted by lack of health care system in the U.S. Although it’s a story rarely told, women have fought for health care rights in innumerable different ways. We are fighting for society in which healthcare is a right. Socialist health care is a radically different approach to health that has had and would guarantee quality health care for all working people. Everyone is healthier when women’s health is guaranteed. 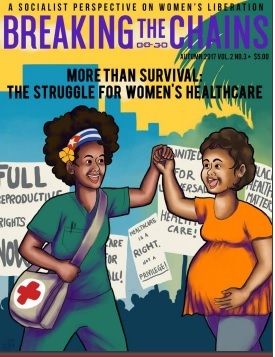 This issue of Breaking the Chains identifies health care as a feminist issue. We examine at length how the intensity of the sexism, misogyny and bigotry woven into capitalist society means that capitalist health care has particular significance for all women in the United States. We address head on how people’s movements throughout history have fought for quality health care drawing from the experiences for Cuba, the Soviet Union and revolutionary Black Panther and Young Lords parties.